I am a Kappa Delta. That's right, I'm a sorority girl. In January of 1993, I transferred to East Texas State University from Ranger Jr. College. My cousin had played football at ET and my daddy did a lot of construction work there. I had been on campus a few times and felt confident about transferring. I moved into Smith Hall, across the highway from the main campus and tried to figure out how to get involved. I don't remember what exactly led me to sorority rush but I do remember that rush was one night of visiting each house with a group of other girls who wanted to join a sorority. Panhellenic organized that one night of visits but then the sororities were free to contact you and invite you to additional events. After that night of rush, I had invitations to join all 4 sororities. Within a few days of joining, I moved into the house on campus. It was a serious upgrade from Smith but not the opulence you'd think. It was still University housing. While at ET, I developed my SG (sorority girl) qualities. I learned about serving my community. I learned how to greet and include others in a conversation. I served at Vice President of Recruitment and developed further as a leader. I was not only in charge of 5 nights of formal recruitment, I oversaw open recruitment (a process of continually bringing girls into the sorority). I learned to organize and motivate. I learned how to manage my time. Years later, I had a boss that coined that term (at least to me), SG qualities. I was working as a training coordinator and was responsible for new employee orientation each week. I was responsible for making sure a member of senior management was lined up to speak to the new employees. When the new employees arrived, I mingled with them and introduced them to the member of management. I was adamant that we change some things up to make new employees feel more comfortable and welcome to the company. It wasn't much different from recruitment. Later as I prepared to hire my replacement, my boss said "Look for someone with SG qualities." What in the world? "Sorority girl qualities," he said "I need some one who can host an event and make everyone feel comfortable. That's part of your SG qualities." I was a little stunned but the term stuck in my mind. My decision to join Kappa Delta has always ranked in my top 5 good decisions (following Christ, marrying Ryan, becoming a mom, starting Valuable are the others). I learned many valuable skills. But the most important part of KD, as in anything, are the people. Through Kappa Delta I've had the opportunity to meet so many wonderful women. Some have stayed in my life for a season. Others have stayed for the long haul. Sunday was Kappa Delta's 119th birthday. My Facebook timeline was flooded with well wishes from women all over the country. Some I've never met. Others I speak to regularly. But we all have Kappa Delta in common. I love Founder's Day because it reminds me to think about our 4 founders - Lenora, Sara, Mary, and Julia. I'm in awe of their SG qualities. 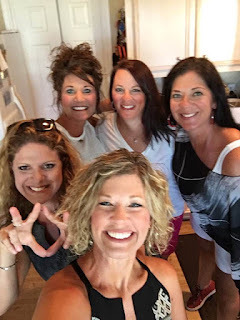 They were so young when they founded Kappa Delta. But their creation has endured for 119 years. I can't imagine that anything I will create will endure that long. I am proud of have benefitted from their vision. I hope that I've contributed to Kappa Delta in a meaningful way, given back some of what Kappa Delta has given me. I am proud of the direction Kappa Delta is moving in today. Building Confidence. Inspiring Action. So, yeah, I'm a sorority girl. A proud Kappa Delta sorority girl!